It’s almost June. For many, this signals that summer is just around the corner. Not so for us here in England. Oh, I guess if you’re reading this and you’re English, you might be thinking, wait – we have a summer, what’s this about no summer in England? Of course you have a season which you optimistically label summer, comprised of June, July, and August. But Brits, I’m very sorry to say, don’t really have a summmmer. There are no swimming pools brimming with kids. There are no long hot days punctuated with popsicles and ice-cold beers. In short, Brits think summer means a few days reaching roughly 70 degrees. Wow… I mean, 70? Won’t we all melt? If one or two days of shocking weather occur (and I do mean a day nearing 80), Brits complain and mutter that, well they enjoy a few nice days, this is just too hot. Sad, but true. Don’t worry Brits, we still love you, just not so much your summers. In short, Brits don’t really get a summer, but merely a sprinkling of warmish days in which they will still choose to drink their beer at an also warmish temperature. Happily, this lack of summer weather doesn’t stop Brits, or me for that matter, from using my grill every chance I get. These chicken wings are to die for. But, I have one trick which I think you ought to try. Grab your wings the morning of your barbeque and throw them into a big plastic bag. Cover them with a mixture of milk, a few garlic cloves crushed and chopped, a dash of hot sauce (such as Tabasco), and let them marinate in the milk mix all day (in the fridge of course!). Other than that, this recipe is perfect! And if you’re not a fan of wings, just switch them out for chicken breasts cut into strips, thread them onto skewers and you still have a perfect finger food appetizer! Also, I must add that the chipotle butter glaze is fantastic and a total keeper. Feel free to make extra and save it in the fridge for up to a week. And lastly, the dressing recipe makes a lot, so if you have leftovers stick it in the fridge and you’ve got home made salad dressing for a delicious wedge later in the week. Just cut a wedge of iceberg lettuce, top with crumbled blue cheese, chopped tomatoes, and cook crumbled bacon. Drizzled with your homemade dressing, you’ve got a winning salad that could be an entrée on a hot summer night. Enjoy the wings my barbequing friends! Pre-heat the grill to medium heat. Use a paper towel blotted with oil to wipe down the grates, this will form a non-stick surface. Toss wings in olive oil and season with salt and freshly ground black pepper. Lay out flat on the grill then prepare the chipotle butter. Combine the finely chopped chipotles, butter and vinegar in a mixing bowl and baste the wings on the grill while they cook. The wings should take 20-25 minutes to cook. While the chicken is cooking prepare the blue cheese ranch dressing. Combine the sour cream, mayonnaise, honey, and lemon juice and mix well with a whisk. 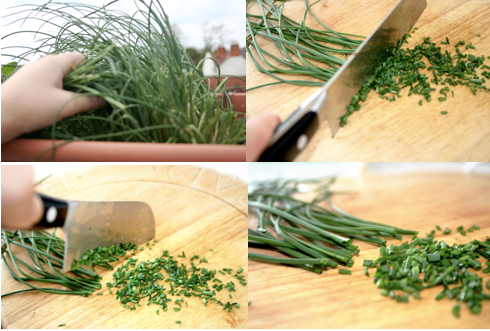 Fold in the crumbled blue cheese and chives and season to taste with salt and pepper. Serve wings with cool blue cheese dressing and garnish with fresh cilantro leaves and lime wedges.